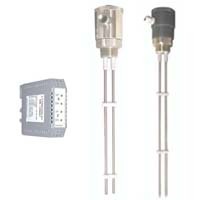 The INTEMPCO series LTX15 dual-probe level sensors are primarily designed for continous level measurement of corrosive liquids in metallic or non-metallic reservoirs. The selection of corrosion-resistant materials used for the probe and process connection ensures that LTX15 can withstand extremely corrosive media. This sensor is ideal for swimming pools, water treatment plants, petrochemical, pharmaceutical and many other commercial and industrial applications. LTX15 is low cost and intended for OEM’s. The LTX15 level transmitter is well suited to measure the levels of very thick conductive liquids or slurries. Because the probes are some distance from each other, they will not easily clog. The probe measures level by measuring the change in capacitance as level changes in the tank.The microprocessor- based electronics converts this capacitance change into a linear, highly accurate 4-20mA signal.